:: Product of the Month - Colorescience SPF30 Almost $50 off! :: Question of the Day: Do I really need a facial? May is Melanoma Awareness Month - Be sure to protect yourself and your family from the devastating effects of skin cancer. Was one of your New Year's resolutions to take better care of yourself? Have you slacked off on that goal? Well, Raspberry Moon is here to help. Purchase a series of 6 facials and you will receive a customized, full size Dr. Caniglia skincare kit - includes: Your choice of Cleanser, the Purifying Toner, the Ultra Hyaluronic Moisturizer and a Deep Pore Scrub, a $140+ value! What better way to restart your New Year's resolutions that may have gotten shoved to the side? Product of the Month - Colorescience SPF30 - Kits almost $50 off! We want you to try the best Sun Protection available to you and your family, Colorescience SPF30 Powder. Yes, Powder! Join the likes of Cameron Diaz who swear by our SPF30. This powder is easy to use, water resistant, approved by the Skin Cancer Foundation and rated by the FDA. Also Check Out Our New Colorescience SPF30 Orb! Puff on the protection with this powder-ful broad-spectrum formula. 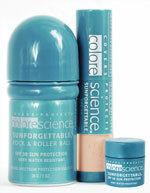 Colorescience's Sunforgettable Orb SPF 30 is the hottest thing under the sun to keep you cool. Toss it in your beach bag or purse to achieve a sunbelievable look every day! Available in Sparkling Perfectly Clear. Question of the day - Do I really need a facial? 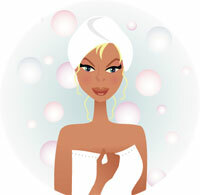 I hear this all the time: "Do I really need a facial? What a waste of money!" Or my favorite, "that is for girls only!" Since when do you guys not want to look good - even if you're going for a more "rugged" look? Well, here is my take - Do you want to look younger, feel calmer and more relaxed? Are you concerned about your health and well being? If the answer is yes to any of these questions, then facials are for you. 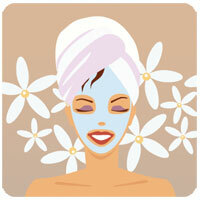 I look at facials as a way to take a "mini" vacation every month and to have someone focus on you for an hour. Because of the products that are used and the massage that is done, facials really help to exfoliate the dead skin cells away, to move lymph to remove toxins and to get the blood moving. All these things work with the body to create a more refreshed look and spirit. And your skin will look healthier, fresher and radiant. I don't know about you but I'm in! Sea salt and cucumber make this once-a-week treatment a must for revealing radiant skin. Your skin is more likely to look dull and ashy if there's a buildup of dry, dead cells on the surface. To speed cell turnover and get great-looking skin this summer, you'll need to exfoliate regularly. "Once a week should do it," says Angelina Umansky, owner of Spa Radiance in San Francisco, who pampers her clients with this all-natural body scrub. The salt and the buttermilk's lactic acid exfoliate, and the cucumber cools. It's especially good before applying a self-tanner to get even color.